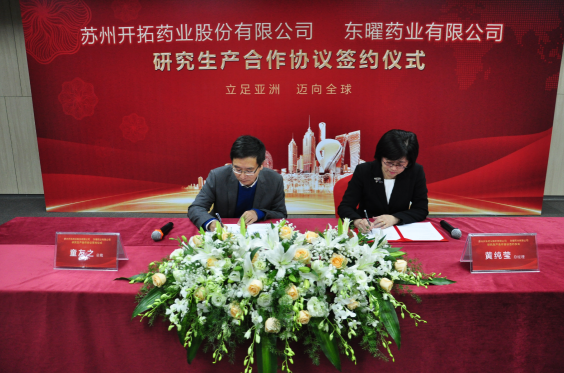 Suzhou, November 28, 2016 /PRNewswire/ — TOT Biopharm Co., Ltd. and Suzhou Kintor Pharmaceuticals, Inc., both located in the Suzhou Industrial Park, Jiangsu Province, announced that they had signed a pharmaceutical research and production contract. Under the contract, Kintor commissioned TOT Biopharm to conduct R&D and production of a 1.1-category targeted new drug. The agreement is helpful to achieve professional division of labor, avoid duplication of investment and construction, establish long-term cooperation and trust relationships among enterprises, accelerate drug innovation, and improve drug quality. At the end of 2015, the State Food and Drug Administration of China (CFDA, now has reorganized as SAMR) selected 10 provinces and cities for the pilot of Marketing Authorization Holder (MAH). According to the new regulation, holders of drug approval numbers can produce approved drugs via in-house production and mandatory production. The resulted separation between the marketing license and the production license will greatly accelerate the process and speed of new drugs marketing. In October 2016, Jiangsu Provincial FDA issued the “MAH Pilot Implementation Plan in Jiangsu Province” to promote industrial restructuring and optimal allocation of resources. Established in 2009, Suzhou Kintor Pharmaceuticals, Inc. is a high-tech innovation company dedicated to innovative drug R&D. The company has a high-quality R&D team and experimental platform. The R&D pipeline includes new generation of inhibitors of androgen receptor, PI3K/mTOR kinase targeted inhibitors, CETP inhibitors for the prevention and treatment of cardiovascular disease, JAK2 kinase targeting for the treatment of arthritis and FGFR/EGFR double-targeting kinase inhibitors for the treatment of various solid tumors such as liver cancer, ovarian cancer and lung cancer. Since its inception, Kintor has be supported by various government funding and grants, such as the National Twelfth Five-Year Plan Special Program of “R&D of Major New Drugs”, the SME Innovation Fund from Ministry of Science and Technology, Jiangsu Science and Technology Support Plan (Social Development), Suzhou Science and Technology Plan, and the Gusu Project for Innovation and Entrepreneurial Leadership Talent Sponsorship. In September 2016, Kintor successfully listed on China’s new third board market, an over-the-counter market for growth enterprises (Kintor Pharm, ticker: 839419). Adhering to the idea and concept of “research and development of genuine Chinese origin innovative drugs”, Kintor has been committed to the new drugs R&D, hoping to bring good news to patients and reduce the cost of medication for the majority of patients. Established in July 2010, TOT Biopharm Co. Ltd. is a high-tech company specializing in R&D, production and marketing of new anti-tumor drugs. The company’s products are mainly based on liposome technology, including monoclonal antibodies and antibody-conjugates, oncolytic virus products, antioncogene and tumor immunotherapy drugs, as well as special formulations of anti-cancer drugs. TOT Biopharm has been committed to in-depth development and application of new formulations of drugs, building an internationally competitive professional cancer drug production base in the Suzhou Industrial Park. The first phase of the project was completed in 2012, including an oral preparation workshop, an injection workshop, and a 500L biopharmaceutical pilot plant. The second phase of the project was under construction since 2016 with increased investment to build a monoclonal drug production base for the production of monoclonal antibody and antibody-conjugates. After the completion of the production base, it will have five 2,000L lines of cell culture scale. TOT Biopharm is always in pursuit of a “Balanced Relationship of Humanities and Sci-Tech” as its business philosophy. It is committed to the development of new drugs with high tech barriers and economic value, focusing on R&D of affordable anti-cancer drugs for Chinese people, providing patients with drug portfolios of the most appropriate and affordable prices. “Let cancer patients have peace and well-being” is the ultimate goal of the company’s anti-cancer business.